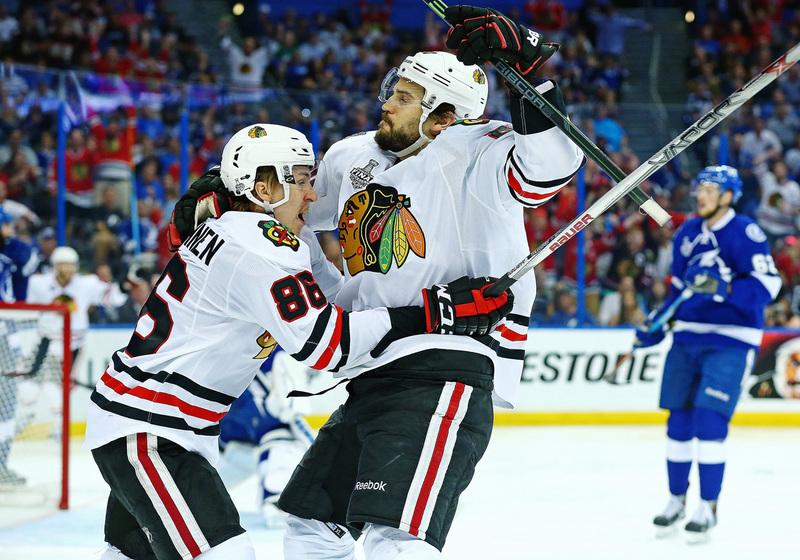 Antoine Vermette's third period goal lifted the Blackhawks to a 2–1 win over the Lightning in Game 5, putting Chicago one win away from taking home the Stanley Cup. TAMPA, Fla. — Forget the mass of costumed characters roaming around downtown Tampa for an anime convention. 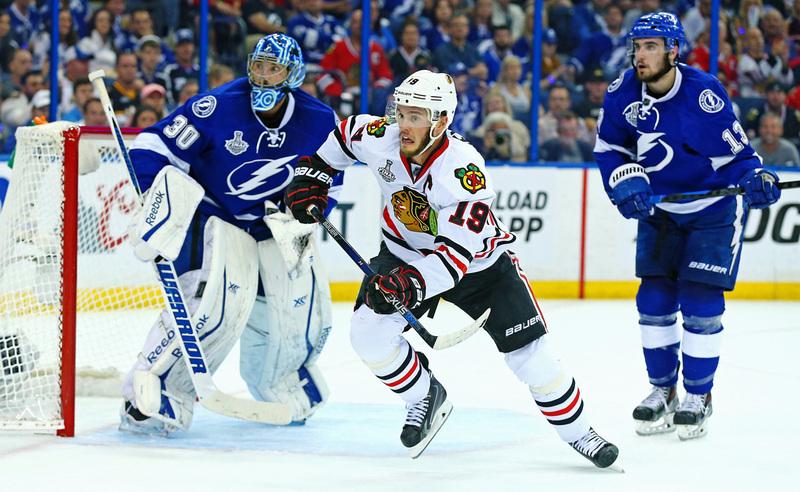 On Saturday night, inside Amalie Arena, Game 5 of the Stanley Cup Final got a little weird. Whether it was the goalie gaffe that led to an injury, the goalie gaffe that led to a goal, the unexpected line combinations dispatched down the stretch, or the winner off the stick of a player who was acquired for depth and defensive duties, the game had a head-scratching quality that fit right in with the four previous games of this series. When center Antoine Vermette scored two minutes into the third period, he gave Chicago its eventual 2–1 win and three-games-to-two series lead. His second goal of the final, Vermette now has two more scores in the series than Tampa Bay’s Steven Stamkos and Chicago’s Patrick Kane combined. 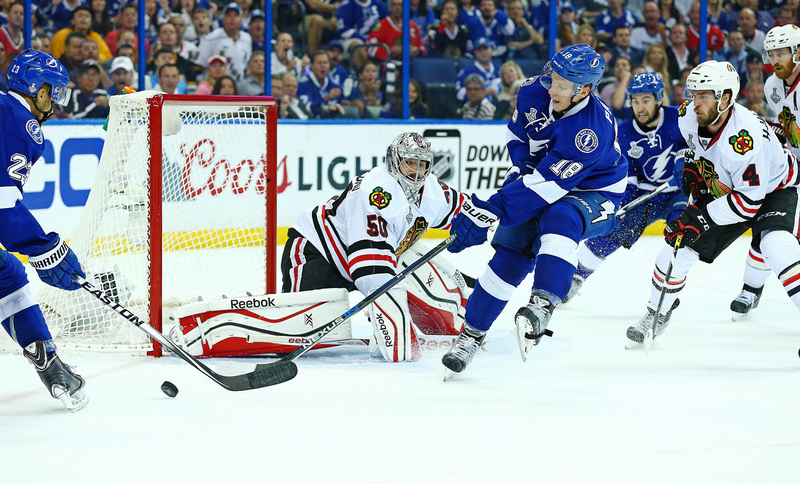 “To me, this series has been, 'expect the unexpected,'” Lightning coach Jon Cooper said. He is only partly alluding to the situation of his goalie Ben Bishop, who returned to the crease after sitting out Game 4 in Chicago with an apparent injury. After stringing the public along with another will-he-or-won’t-he pregame routine, the towering goalie looked far more comfortable than he did in Game 3 when he labored through a Lightning win. Still, despite his injury, Bishop put together a largely respectable performance on Saturday, making 27 saves. 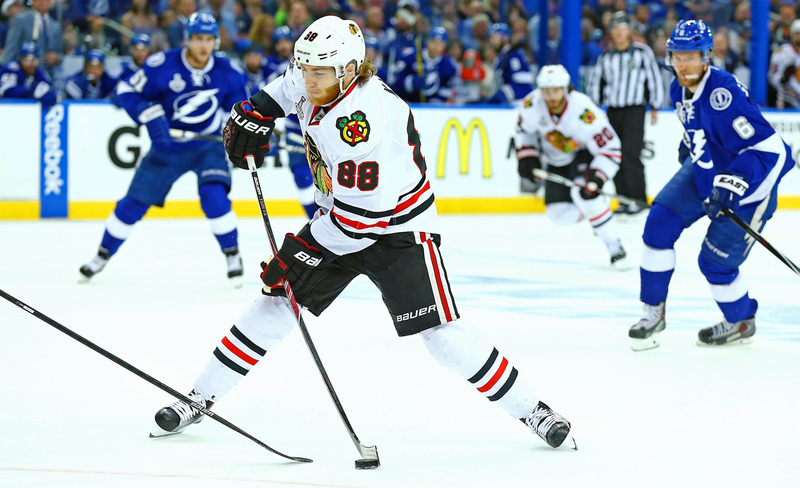 His notable stops—on Chicago forward Andrew Shaw in the opening minutes, on winger Marian Hossa in the second period, and in a couple of goalmouth scrums in the third period—kept Tampa Bay competitive in a game that Chicago dominated early. More than the suspected lower-body injury that has ailed him, Bishop’s greatest affliction in Game 5 was a first-period brain cramp. 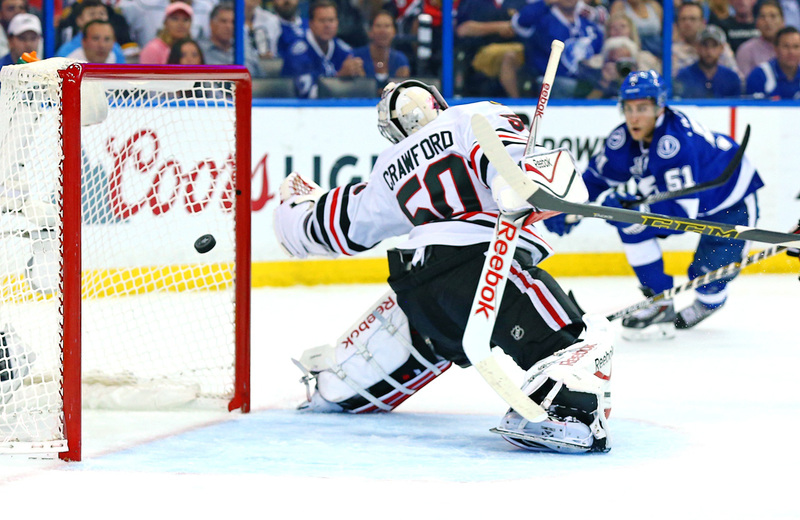 About six minutes into the game, just after witnessing his Chicago counterpart Corey Crawford nearly give away a goal by misplaying a puck, Bishop came roaring out of his crease with an eye on hitting Steven Stamkos with a breakout pass. 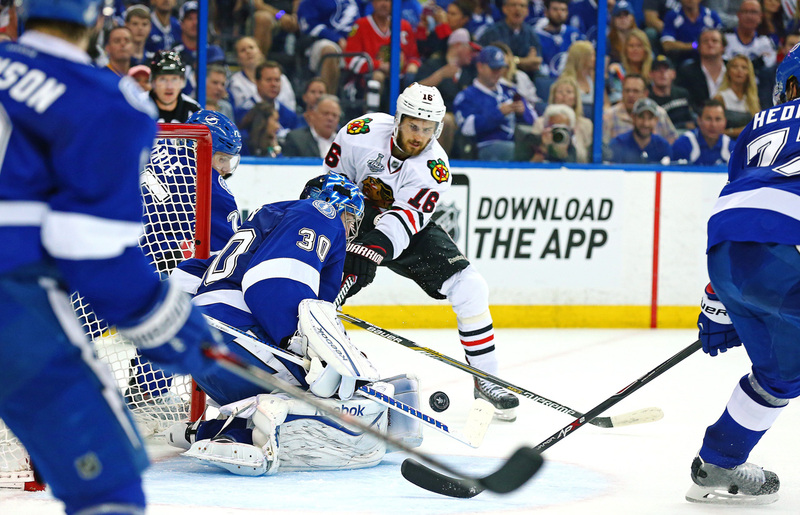 Bishop thought Victor Hedman and Chicago winger Patrick Sharp would go off for a change, but they didn’t. 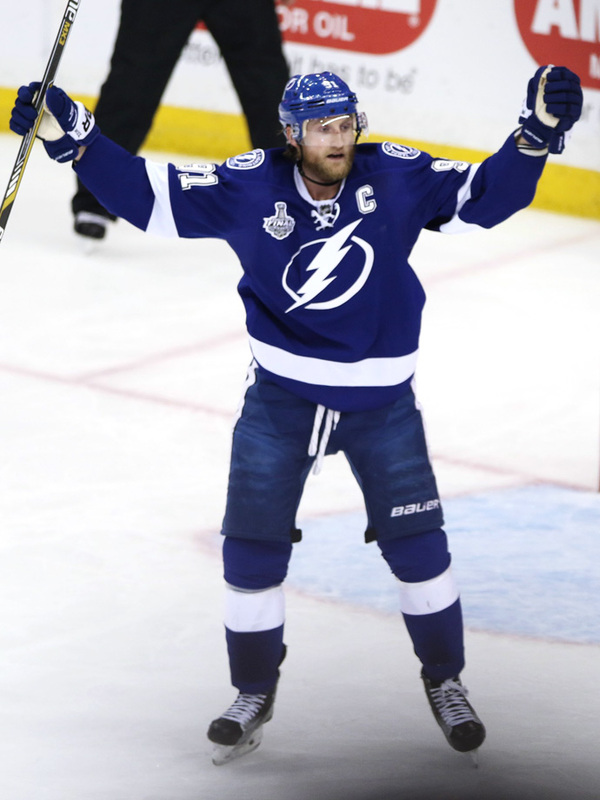 He called out to Hedman, but the communication was lost in the din of the crowd. Hedman, who was preoccupied with Sharp coming in with speed, ended up colliding with his own goalie, leaving an empty net for Sharp 30 feet behind him. “In hindsight, yeah, I probably should have stayed in,” Bishop said after the game. It was ironic given that the gaffe on the other end also ended up hurting the Lightning as well. On Crawford’s misplayed puck earlier in the period, Tampa Bay winger Nikita Kucherov tripped and went down hard, slamming his shoulder or collarbone into Chicago’s net. After just three shifts, he did not return, and his absence threw the Lightning’s line combinations into some disarray. 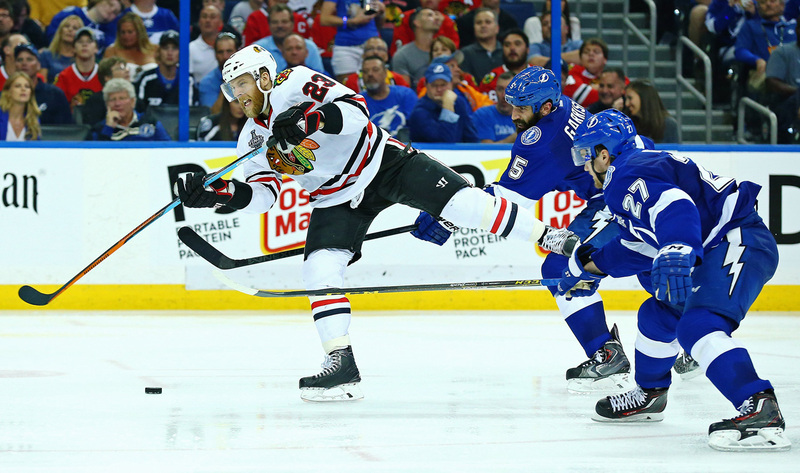 As the game came down to the wire, too, some of the Lightning’s stars were conspicuously absent from the ice. 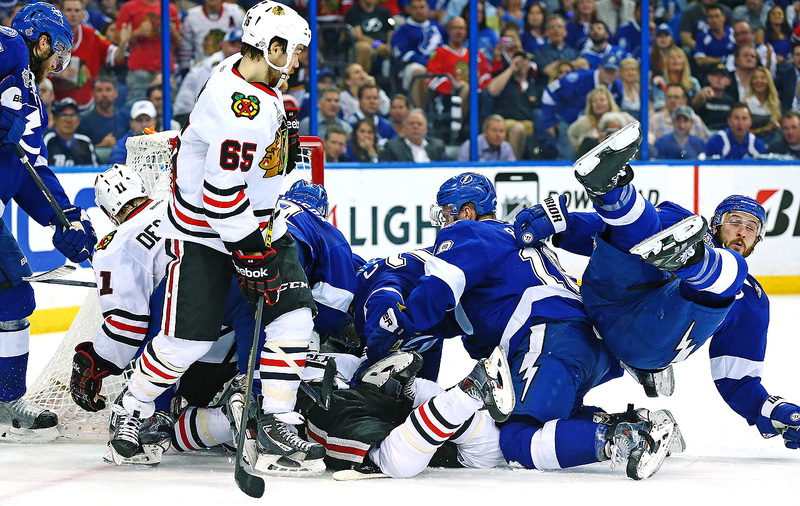 With less than four minutes remaining, the Blackhawks had iced the puck, and Cooper sent out his third line and kept his top five—Stamkos, Alex Killorn, Valtteri Filppula, Tyler Johnson and Ondrej Palat—seated on the bench for nearly 90 seconds. 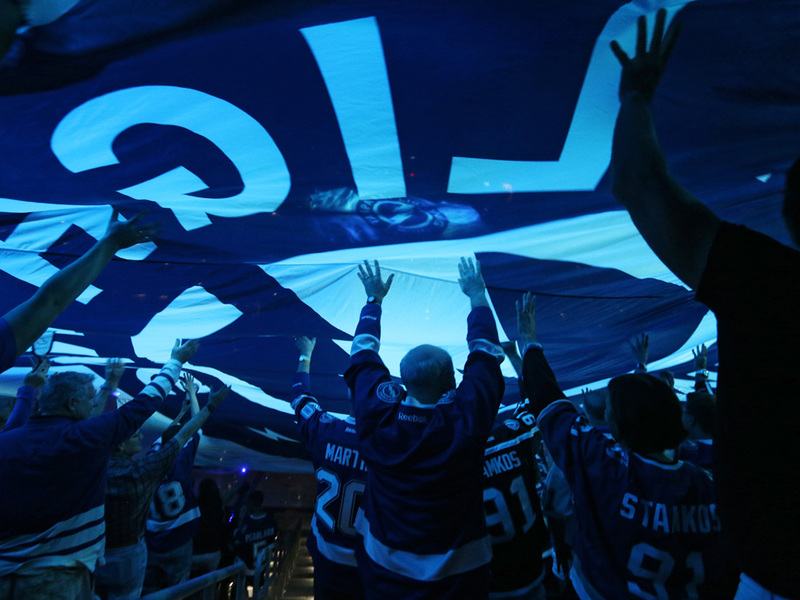 It wasn’t until 1:32 was left on the clock that Stamkos, Johnson and Palat were sent out. That strategy certainly hasn’t been an issue for the Blackhawks, who continue to ride their workhorses with abandon. But depth has kept Chicago alive. Vermette’s score, a rebound created by a shot from linemate Kris Versteeg, has defined the series in some ways. Asked about his effectiveness in the series, the two-way center quickly pointed to defense first. With one last victory left for the Blackhawks to claim their seat at history’s table, Game 6 in Chicago promises to serve up the best game from both sides. As Cooper pointed out, Tampa Bay’s margin for error now reaches zero. If the Lightning play a flawless road game—as they have become accustomed to doing this postseason—they will force one final do-or-die game. And if not, then dynasty status awaits the Hawks.